The houses on "Pretty Little Liars"
When I heard that Pretty Little Liars is filmed on the same backlot used for Stars Hollow on Gilmore Girls, I knew I had to take a closer look. Sure enough, you’ll recognize a lot of same houses and streets if you’re a G.G. fan like I am. 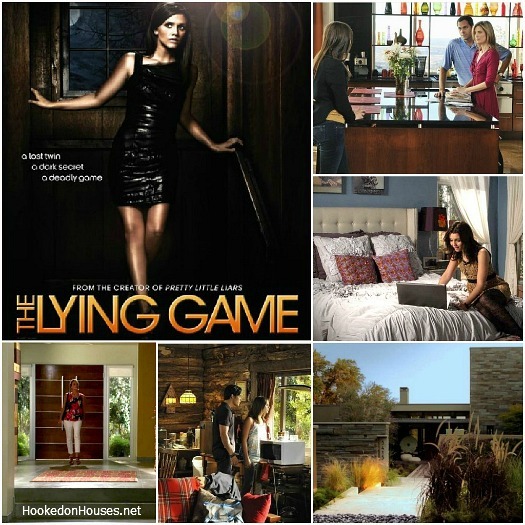 The show is about four high school girls–Aria, Spencer, Hanna, and Emily–who are dealing with the mysterious disappearance of their friend Alison. 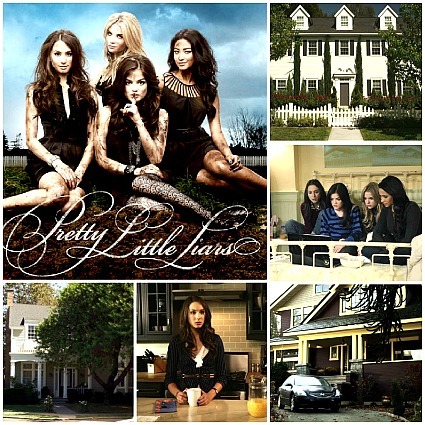 They live in the posh town of Rosewood, Pennsylvania, in four beautiful houses. Aria’s family lives in a beautiful old Craftsman-style home in Rosewood. The police show up at the girls’ houses a lot on this show–the minute they get out of one scrape, they get into another! 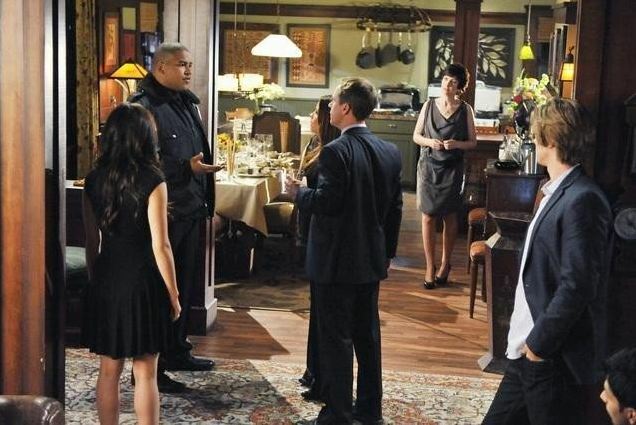 Chad Lowe plays Aria’s dad Byron, whose affair with a fellow teacher has put his marriage in jeopardy. Aria is played by Lucy Hale. How I Met Your Mother fans may recognize her as Robin’s little sister. The show is based on a popular book series by Sara Shepard. 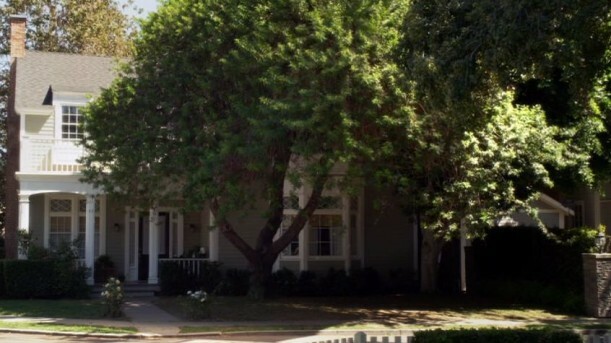 Hanna Marin (Ashley Benson) lives in a traditional two-story with a white-picket fence. Since her dad left them, she and her mom Ashley (played by Laura Leighton) are having to work hard to keep up appearances. Hanna was supposedly “the fat one” who went to great lengths to lose the weight and reinvent herself after Alison disappeared. In flashbacks they make her wear baggy sweats to try to convince us she was chubby. We finally got a look at Hanna’s bedroom recently, in Season 2. Her yellow lamp looks like the ones Rachel Zoe has in her dining room, doesn’t it? The house is painted in shades of soft green and tan. It almost feels like pages out of a furniture catalog to me. The town of Rosewood doesn’t feel so much like a real town as a state of mind. Since PRETTY LITTLE LIARS is shot almost completely on the Warner Brothers lot, there is a dream-like quality to some of the compositions that feels melancholy and mysterious, very Hopper-esque. It’s a really interesting discussion about how Edward Hopper’s paintings have influenced the show. You can read the rest on Buckley’s blog. Spencer’s family is the wealthiest of them all. They always seem to come and go through this back door to the kitchen, so I haven’t been able to snap a pic of the front of the house yet. 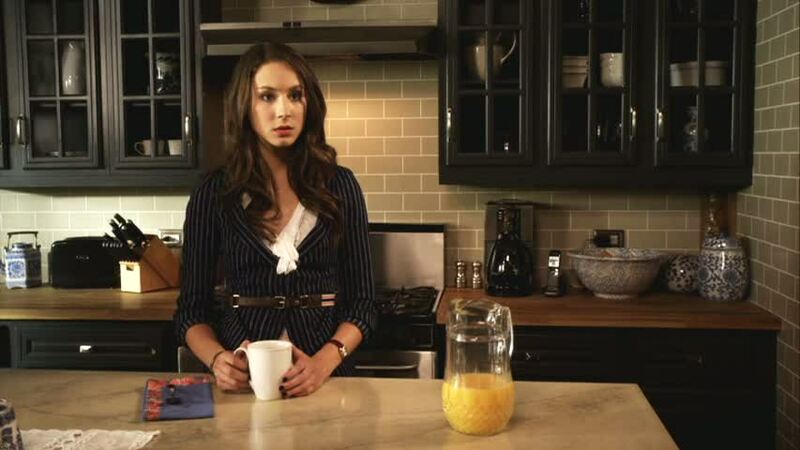 Rich-girl Spencer Hastings is played by Troian Bellisario. The San Francisco Apartment in "Just Like Heaven"
Ooo, the craftsman is my favorite, but I love the decor of the white traditional, Hanna’s house. Julia I have not seen this series. The homes are wonderful and yes, I adore that wide window-seat and have always wanted one! Loving the shades of greens and vintage pieces in Emily’s house especially the beds. This is my kind of house! Have a blessed week, Julia. The wallpaper in the bedrooms jumped out at me. Is this a trend I’ve missed until now? Those girls are supposed to be in high school?! 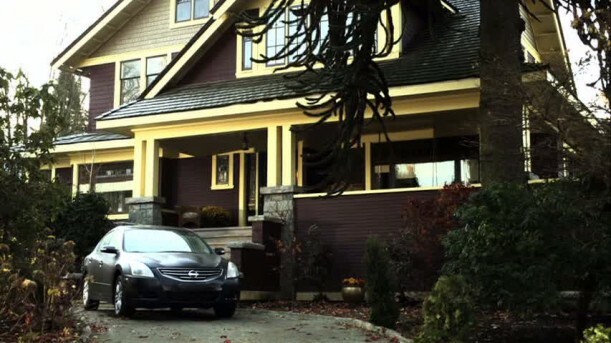 My favorite house is Alison’s, though we don’t get to see the interior. I like the craftsman too. Yeah, but as usual on a show about teens, most of the actors are really in their 20s. I think Sasha Pieterse, the girl who plays Ali, is the only one who is actually a teenager (according to the IMDb.com she was born in 1996). 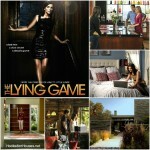 I’ve never watched that show but i’d say the houses look way better than on other show like Desperate Housewives! I love some of the houses on DH! Bree’s is my favorite! Julia, since it’s the last season, would you consider doing a DH post? Desperate Housewives has a huge following and perhaps it’s just me, but I’d put money on the idea that most viewers love the women’s homes as much -if not more- than the storylines! All this time and I didn’t know that it is shot on the same back-lot as Star’s Hollow was shot on!!! 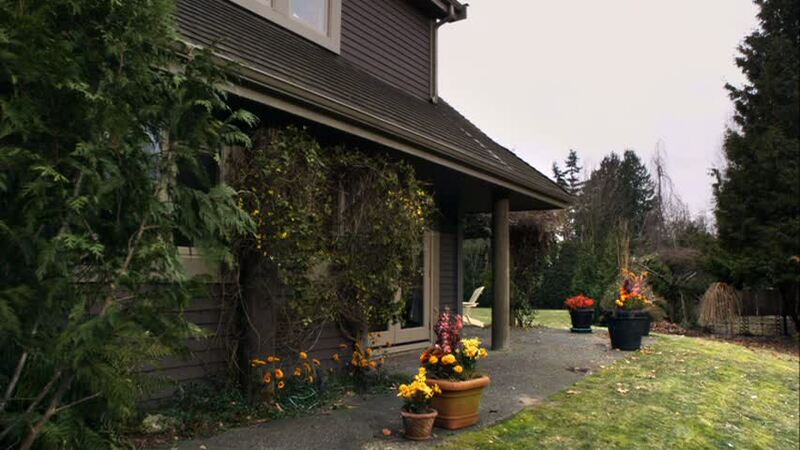 I think I like the exterior of Hanna’s house the best. They did a pretty good job with the girls’ rooms–they look lived in! I love this show! I love Hanna’s house, that kitchen is to die for! And also Spencer’s house is really nice. If I have one complaint about the show it’s that Aria needs a different stylist. Seriously. She is driving me nuts. Do you mean a stylist for her clothes or room, ’cause I love her clothing and her style, it’s vintage and cool. Her room is amazing to but it is a bit smaller than the other girls bedrooms. The window seat in Emily’s room is sooooo cool! I love the shelves in the niche on either side. And I *think* one of the doors lead to a bathroom and a closet on the other side. 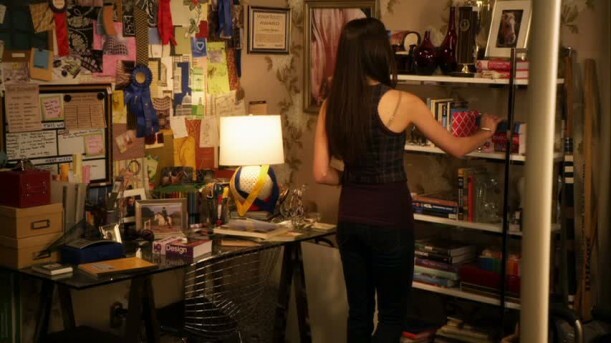 There’s a lot of scenes in Emily’s room and I love the decor style in there. Is Emily’s house the one they used for Kim’s Antiques in Gilmore Girls? I recognize the second floor railing, but can’t remember if that was Lane’s house or just a random house in the background a lot. I’d be happy to take off work and stay home for a week watching Gilmore Girls to investigate this further. You just let me know. There are similarities, but I think Kim’s Antiques may have been a little bigger. Hmmm. I think I will put you on that assignment, Aryn–get to work! Ha. That’s so interesting. I wouldn’t have guessed it was the same. Thanks, Kayelani! when I took the set tour they also mentioned that Emily’s house was Ross and Monica’s Childhood home from Friends, most noted for the prom episode! 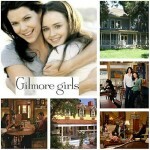 Love this show and Gilmore Girls. Recently, during a work trip to LA I snuck off and did the WB tour. It was cool to see it all. As I was the only person on the tour that spoke English the guide tailored the tour to me and I happen to LOVE PLL. My 13 year old cousin got me hooked. How fun! I’d love to take that tour someday. I have not watched this show, but the houses are gorgeous. I love the exterior of Aria’s House, but love the interior of Emily’s house. Thanks for sharing these with us Julia! I have never seen the show but the houses are beautiful. The exterior and the interior are wonderful. Thank you for this post! i’ve been obsessed with aria’s room for some time. don’t watch the show, just look at screencaps of it. i did see a few episodes the other weekend though. the wood in aria’s house eats up the light, but i do love the eclectic, global vibe the parents decorated with. hanna’s room was a treat to finally see this year. btw the wallpaper, the daybed and all the other accessories, it is pretty busy. love that they painted that west elm daybed lilac. spencer’s room is the least attractive to me. the style eludes me, the patterns don’t match. it just doesn’t seem like a kid would have picked any of that. we’ll call her the ‘lorelai’ of that group. 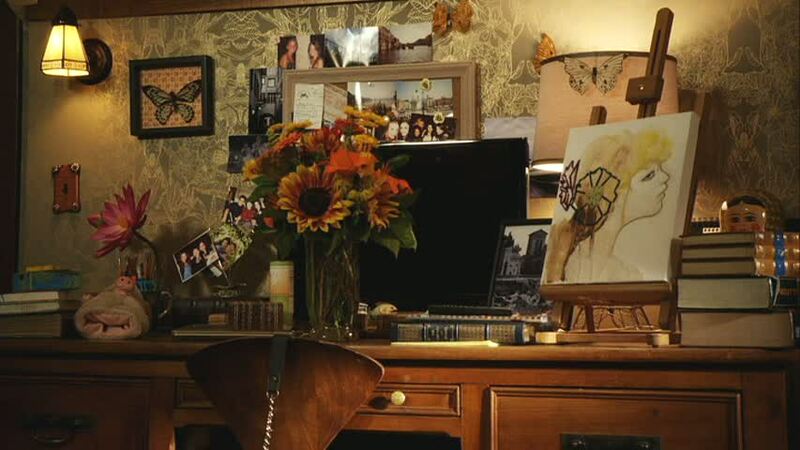 and you can’t miss all the high-end decor like those $1,000 armchairs in hanna’s and emily’s rooms. the teacher aria is dating also has a very cool studio apartment. funny how in tv/movies some young bachelor just out of college decorates his pad with loads of vintage leather and accessories. while in real life such a guy would have an ikea bed, bookcase and lamp. The craftsman is my favorite too. It’s odd how the kitchen is exposed to the front hall–that’s probably not likely for a house of that era, but I like the effect. Nice to see a comparison of all the different styles of the homes. Glad to see a Craftsman style house (though it is cluttered and messy)! I feel like I’m always seeing more traditional home styles or lots of white or french influenced homes. The clean lines of the craftsman home will never go out of style! Wait? Holly Marie is playing a teens mom? Yikes. She’s like 3 years older then me. I do love Aria’s house. It’s gorgeous. right there with you. i was shocked too. then i remember my “twin” cousin has a 15 year old. we are, in fact, old enough. You should do a feature of the One Tree Hill homes! Those sets are Gorgeous! **and i also designed a bedroom for alison which we see in season 2… first shown in our halloween episode. I’m a huge fan of the show and I’m always inspired by all of the beautiful set designs. Where can I find lamps like the white bedside lamps in Hanna’s bedroom? I’ve been looking everywhere but can’t seem to find anything that comes close! I’d really appreciate your help. Hi Rachel! I absolutely love everything you said you have designed for the show and would love to know if you also are responsible for the staging of the kitchens and their specific dinnerware? I have fallen in love with the accessories in both spencer’s kitchen (all of the blue and white dinnerware and decorating elements are beautifully done!) 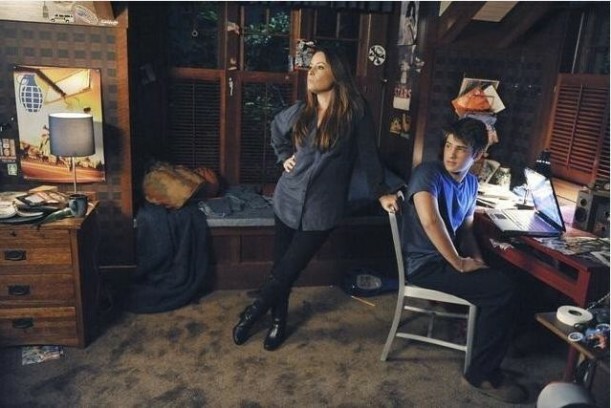 and in Toby’s apartment. I recently watched the episode where Spencer reveals what Toby has been hiding and the episode ends with Mona eating the lasagna off of Toby’s gorgeous blue and white plates. 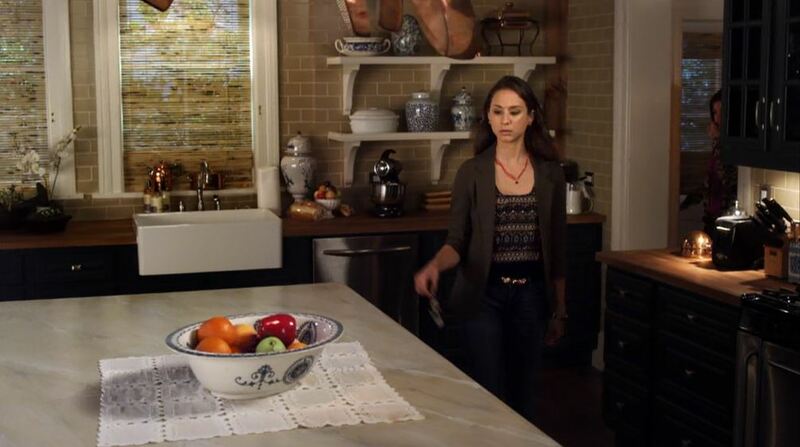 I was wondering if you have any idea, or know someone who I could ask, who the design/maker of the dinnerware is in both Spencer and Toby’s kitchens? I would love to find these sets and buy them for myself! My girls love this show! I will email the link to this post to both of them. My oldest read the entire series long before the show was made. I like Emily’s house best. 😀 Thanks for putting this post together for us! Ahh I just saw the production designer left you a comment – amazing! I bet you were so excited :). Ok, you got me hooked on GG now this may be my next addiction. Tell me about it. More drama I assume than GG? How behind am I? 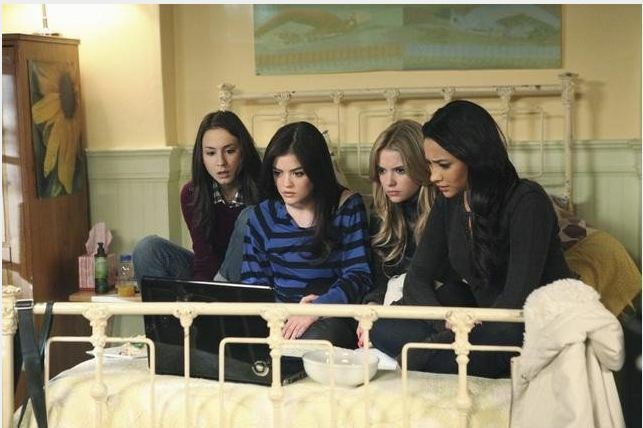 I love Aria’s house! The outside colors are great together. I also love the bright clean finishes on the interior of Hanna’s house. Can’t believe the production designer popped in…how cool!! That’s fabulous! Thanks so much for this info, Erin!! Would you mind posting the house from the remake of When a Stranger Calls on your website? It’s such an awesome, contemporary house but most of it is shown at night or in the dark so it would be great to see the actual house. Thanks. Sorry to keep commenting but here are a few more items from the show. I realize you don’t have pictures of all of these items but thought I would go ahead and add these items as well. I haven’t been able to identify the wallpaper panels used in Alison’s bedroom (mainly because I can’t see the whole pattern) but my guess is it is a de Gournay wallpaper (hand painted silk wallpaper) or some sort of tropical chinoiserie pattern. Erin, you have a great eye. can you identify the bedside lamps in hanna’s room? I think my favorite houses were Hanna’s and Aria’s. They look so homey and comfortable. Although, Spencer’s, Emily’s, and Allison were beautiful too I think I just prefer Hanna’s and Aria’s more. Hey, not sure if someone else already mentioned this but remember the episode where Christopher’s dad dies and Rory and Lorelai go over to his parents’ house to comfort him because he’s staying with his mom? 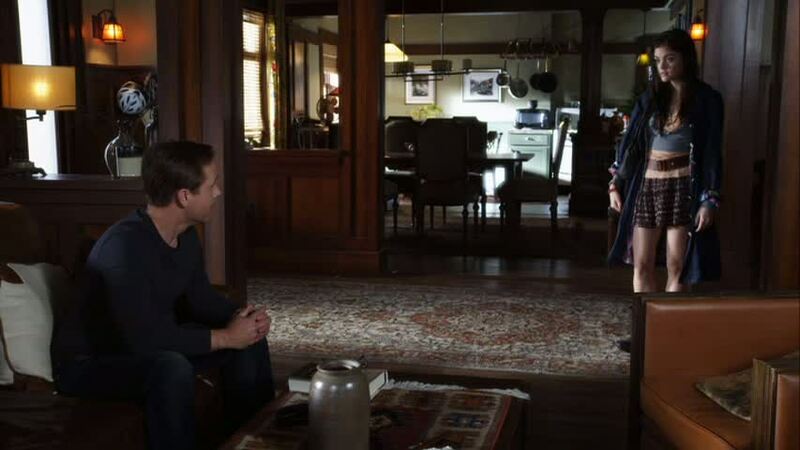 I just realized that Hanna’s house is the same as Christopher’s parents’! Oh, my gosh, is it really?! Good eye! I wonder what’s the name of the wallpaper hanna has in her bathroom . I really love the design. I love this website, and I love the color of Hanna’s kitchen on PLL. Has anyone been able to figure that out? It looks blue-grey in some scenes, green in others.I would love to duplicate it, but can’t seem to come close! I would love to see pictures of Ezra’s house. It’s the most adorable little place I have seen. It has a very ‘You’ve got mail’ “feel” to it, except Ezra’s pad is designed for a male. I know that it is a set but I thought the design was brilliant. Does anyone know where to get the coral looking sculpture in Hanna’s dining room. It is awesome. I have looked everywhere for it and found a similiar item but nothing exact. Any help would be appreciated. I love PLL, but hanna & spencer’s houses are my favorite. i like the overall look & feel of the interiors of hanna’s house. 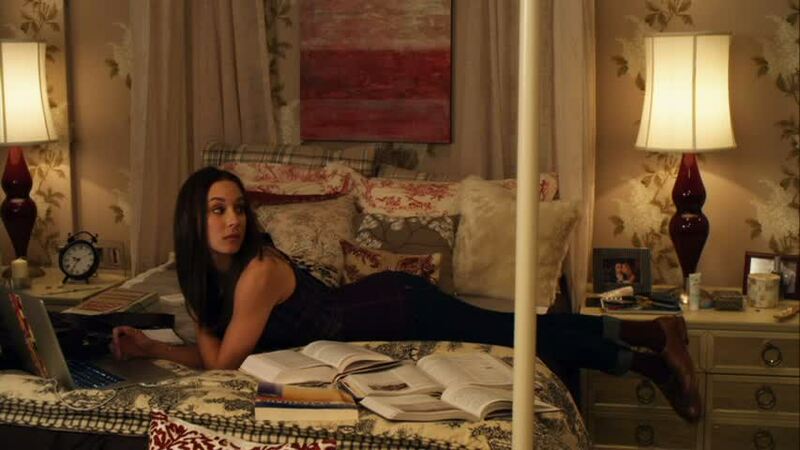 i feel like spencer’s house – particularly her bedroom is so grown up and posh. they do a great job with set dressing as well as costume design on this show. so many great fashions and trends in this show. they’ve hit the nail right on the head! Does anyone know where u can buy the white wall art. Hanna. Has in her kitchen?